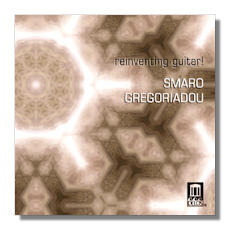 "…Gregoriadou is incredibly accomplished, musical, and intelligent, I speak for the moment on the unique timbres she draws from her guitars and the utterly fascinating effect this has on the ear. It's a brighter tone than most, for sure, and entirely idiomatic…"
These comments still apply wholeheartedly to this release, which arguably features even more adventurous repertoire choices and outstanding playing. Both albums showcase this guitarist as an insightful and gifted artist devoted to changing the way we look at her craft. What a rich range of colors she draws from the various guitars at her disposal, each displaying the masterful writing of each piece. If "Reinventing Guitar II" was an adventure, this is perhaps even more so, and exceptionally worthwhile. Sure, the Scarlatti sonata may be fluff, but it serves as a very fine opener. With the Bach we are in a different world entirely. As in my previous review, it is truly astonishing how natural Gregoriadou makes each arrangement. And the tone! It's a commanding technique, and each measure is treated carefully and sensitively. The Bach is a masterpiece of its kind, and played to the nines. Check out the darkly brooding runs in the third movement, or the dancing effortlessness of the Gigue. This is really good. But even more impressive is the way she uses each of her instruments to switch moods and genres. The José sonata, a piece not previously known to me, takes on a sweetly mellow air that contrasts markedly with the Bach. Additionally, the piece is absolutely lovely and deserves attention from any guitar aficionado. Gregoriadou doesn't miss a beat, weaving a tapestry of sound that beguiles as much as it intrigues. I was struck time and time again by the unique timbres on display. To recognize that different guitars make different sounds is generally simple. Yet, effectively using each instrument well to suit different styles is another matter entirely. Gregoriadou is a master. If the notion of Greek guitar music sounds appealing, rest assured that it is. The Kertsopolous is a stunning work that does exactly what its title implies. Vividly and excitedly it draws seemingly every conceivable color from the guitar. Guitar recitals are so dominated by the Baroque and Spanish composers that it really is a treat to realize how much else is out there. And Gregoriadou proves herself a fine composer with these two Balkan Dances. They are unblushingly virtuosic, while drawing on some exceptionally unusual tones. They are truly spellbinding. I can recommend this program unreservedly to anyone willing to go on a musical journey. As a whole, it's rewarding as anything out there.